At the start of 2015, RightMove was searching for a partner that could increase its fill rates to drive revenue growth. Displaying advertising from non- real estate brands was a new strategy and needed to be approached with caution. Whilst the company deliberately limits the inventory made available to such advertisers, they offer an active and high quality user base. 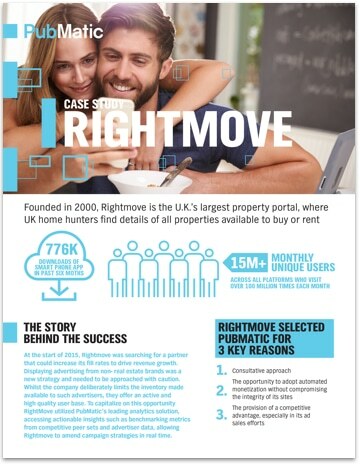 To capitalize on this opportunity RightMove utilized PubMatic’s leading analytics solution, accessing actionable insights such as benchmarking metrics from competitive peer sets and advertiser data, allowing RightMove to amend campaign strategies in real time.